Worried about losing your expensive mobile and its personal sensitive data? 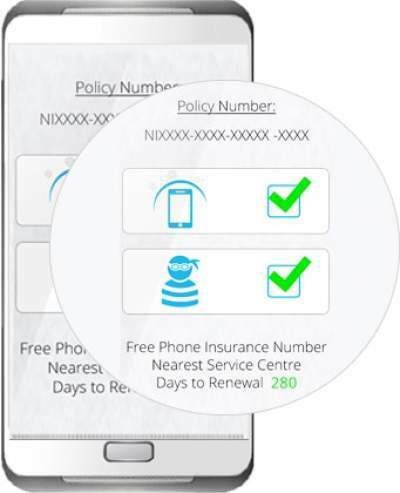 syncNscan is a complete and worthy online mobile insurance which protects your smartphone from theft by violent means, accidental damage & liquid damage, and protects important personal data by backing it up onto the cloud servers. The screen and motherboard (internal circuitry) are the most expensive parts of a mobile. A screen cracking or mobile not working due to liquid entering the phone is very common. Mobiles can also get stolen or damaged in other ways. syncNscan protects you against all such scenarios. Additionally, if your mobile is lost or stolen, you can also recover your personal data like Contacts, SMS, Call Logs, Videos and Photos from cloud servers securely. In case of theft (by violent means) or loss, you can remotely activate the alarm, lock your mobile and wipe your personal data. syncNscan will help you live your mobile life free of worries about losing your data or damaging/stealing of your mobile. Buy syncNscan insurance for mobile & get your mobile phone INSURED against Damage, Theft (by violent means), Data Loss, Spam & Viruses! Accidents are abrupt & often uninvited and anybody can be a victim of it. Now register theft claim WITHOUT FIR! 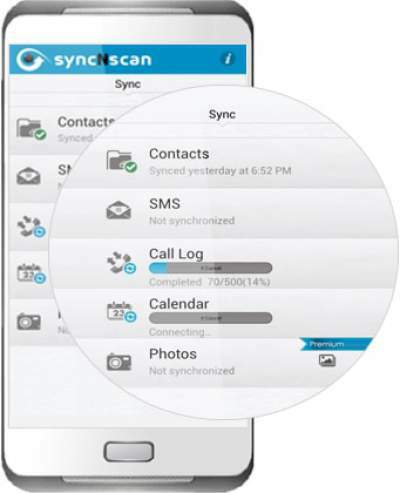 With syncNscan auto sync feature, you don’t have to worry about losing your mobile data like contact details, important messages, call logs, calendar, videos and pictures. Whatever data, information or memories your phone has in it, syncNscan automatically stores the backup for you onto our cloud server. You can backup automatically on daily, weekly or monthly basis. You can view your data anytime (by logging into your web account) and even restore it (to any smartphone) any time. In case of loss of phone, you can restore data from the cloud onto any smartphone and can get yourself restarted in NO time. No more worries of losing friends, clients, colleagues! 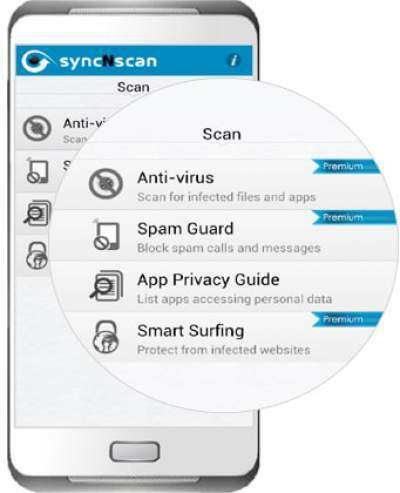 This feature of syncNscan proactively scans your phone against viruses, malware, spyware and trojans and even blocks or deletes whenever required. It not only blocks malicious sites & phishing sites but also helps block spam calls & SMSs via its Spam Guard feature. It also helps you identify personal information that any installed app, on your mobile, accesses. So, syncNscan is not just an insurance for loss but also keeps you away from viruses! Your lost phone can now be secured from getting misused! Let your dear ones help you in case of emergency! 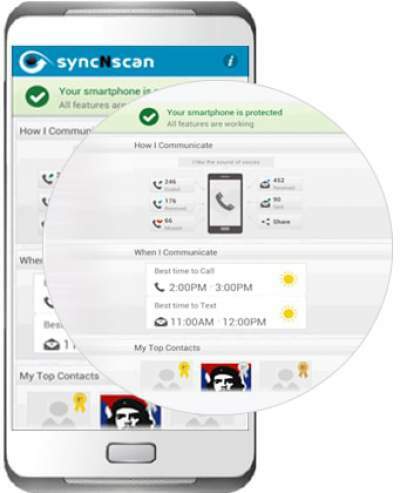 syncNscan understands how you use your phone by sensing your communication styles for example how many calls/SMS you do, how many calls/SMS your receive, how many calls you miss, your preferred contactable time by judging your calls & SMS time, your top contacts whom you call the most and your top choices for websites & apps. 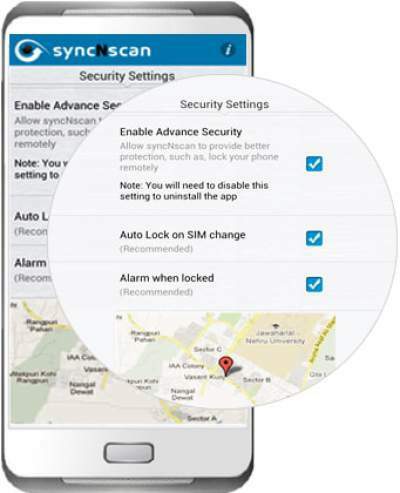 INSURE your mobile with syncNscan mobile insurance NOW! Contact support at +91 888 273 1212 or email at support@syncNscan.com for more details.